Come see the world renowned pages for yourself in Germany! As the world’s first printed best-seller, there are millions of different volumes exchanged throughout Europe. This week, we’ll take a look at 3 interesting facts about the rarest, and most influential printed book in history. Let’s travel back in time, shall we? During the early 1450’s, Gutenberg allegedly produced 180 copies of his bible. Compared to our massive printing press today, this number may seem quite small, however, in 15th century Europe, only about 30,000 printed books were circulating around! So, that measly 180 actually reached many different people. The bibles were said to be exceedingly correct, and had, essentially, no errors in them. The text did, however, need to be read with glasses. No two biblical copies were exactly alike! With 1,286 pages bound in two volumes, some texts were printed on paper, while others were made using vellum, an ancient parchment made of calfskin. Each copy of the 180 produced contains it’s own unique typography and degree of decoration. Gutenberg usually used red text for headings, and once this became a bit too time consuming for him, he abandoned this tedious method and used blank spaces in is margins instead. Later, professional scribes added handwritten chapter headings as well. 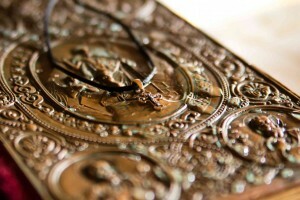 Each copy has its own special artistry and are symbolic relics of the printing press’ living legacy. Of the 180 copies Gutenberg wrote, only 49 remain today. Kept from harm in certain libraries, universities, and museum collections, less than half are complete and some simply consist of a single volume, or a few scattered pages. Germany holds 14 copies, while the U.S. has 10. The rest have been auctioned off to owners around the world for millions of dollars. Book your next trip with AESU Germany and visit the Gutenberg Museum in Mainz to see the world-renowned pages for yourself! AESU offers several trips to Germany, including: Euro Focus, Great Escape, and Euro Spree. Explore Germany and its beautiful scenery, plus marvel at the first mass-produced printed pages at The Gutenberg Museum. This entry was posted on Thursday, August 11th, 2016	at 11:06 am	. You can follow any responses to this entry through the RSS 2.0	feed. Both comments and pings are currently closed.